We offer a custom program to create well-being products specifically for you. We will take detailed information from you about your wellness concerns, including any medications you are taking and your favorite scents, the ones you don't like and any possible allergies. Your personal profile will be kept completely confidential. Please note: Unless otherwise noted, the prices above do not include any products prepared as result of your consultation/service. All products are custom prepared based on each individuals requirements. You will be provided a variety of options and costs upfront for you to make an educated choice that fits your budget and lifestyle. I have been wanting to e-mail you for quite some time, but I haven’t been able to put into words how truly greatful I am for you. And for your oils. First off, the oil blend for my osteoporosis brings about sense of protection. I plan on coming to you for more of that in bulk when I am done with my current bottle. The gift you gave me – the Benessere balm – is amazing. I put it on every morning. I rub it on my feet… Finally…the three custom oil blends, Vagal Tone, Focus, and Anxiety… These have been life savers. Since starting to use them, I’ve had more good days than bad days. I am indeed more focused, more outgoing, more talkative… I had gone through a period where I just did not want to speak. I was also having very dark thoughts… I feel much different now. I attribute this to your oils (and my physiotherapist who also does acupuncture on me, working on depression and anxiety). And while I still suffer from depression and anxiety – it is largely because of YOU that I don’t feel the need to go on anti-depressants (which was something my doctor was suggesting…). “Thank you” isn’t enough, but I don’t know what else to say at the moment. You are an angel and I am so glad I know you. In 2005 I had a back surgery, laminectomy and disectomy operation on my L4 / L5 disc. Since then, I have tried various pain relieving creams, oils, and gels since lower back pain is a constant in my life. I am currently doing a doctorate at Ottawa University and my sedentary life, stress, and lack of sleep often cause lowe back pain. 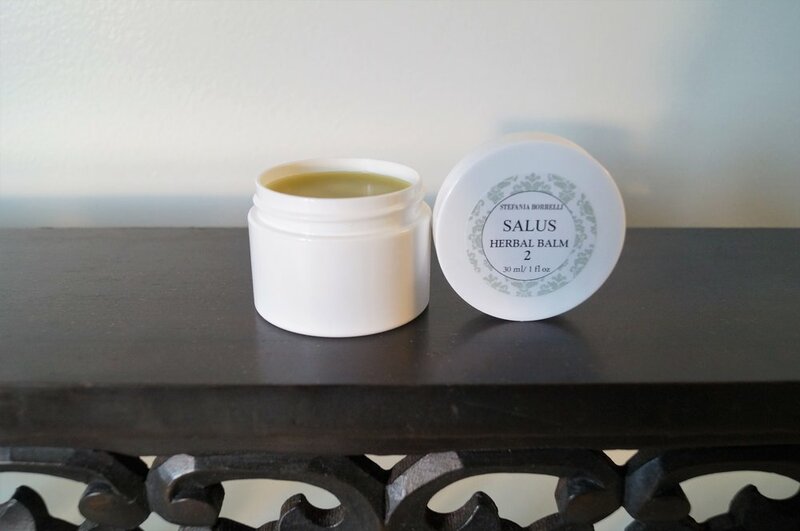 Happily, I discovered Stefania’s Balm with Italian Pino Mugo (Mountain Pine) and Abete Bianco (White Fir) oils.” It worked instantly! It smells wonderfully, it’s not greasy, does not stain clothes, and relieved my back pain. I strongly recommend this cream for anyone with pain but also HIGHLY recommend Stefania’s classes… she is a kind, talented, knowledgeable, good hearted person and I am so happy I met her.